Drunk?! No problem because you will still look amazing in this tunic at last call. 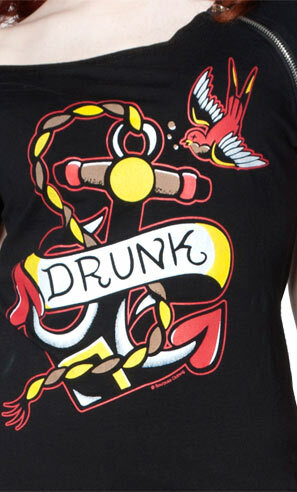 Extra long black tunic dress with an anchor, swallow and a banner that says "Drunk." Tunic has one silver zipped sleeve, wide neckline and wide waist band. 95% Cotton/5% Spandex.